Recently I needed the FTP password for a site I manage however I couldn’t find the PW anywhere. Fortunately, the password was cached in FileZilla however from the UI, there is no way to get the password. No problem, we have a solution. 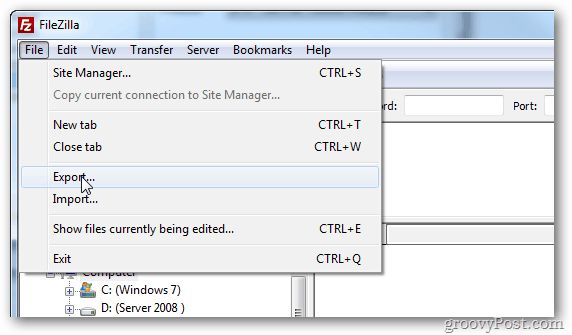 The Filezilla Site Manager window is where you set up each server connection. Here your username will be displayed, however, your password will be hidden. 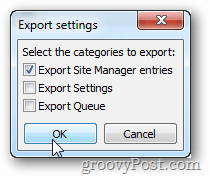 Check the “Export Site Manager entries” box and click OK.
For simplicity’s sake, save the file to your Documents folder with the default FileZilla.xml name. 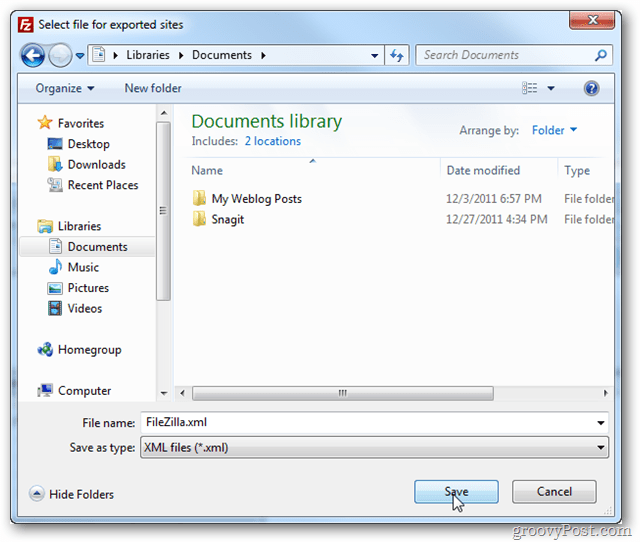 Now exit Filezilla and browse to your Documents folder in Windows. Open FileZilla.xml. 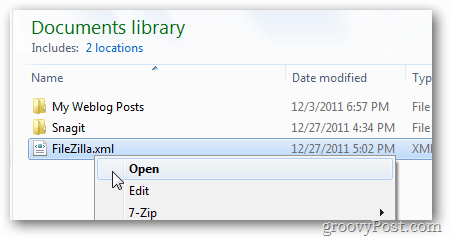 If you haven’t assigned a default XML reader, the file will open up in Internet Explorer. All of your user names and passwords will now be visible within the opened XML file. Usernames are on the User line. Passwords are on the Pass line. 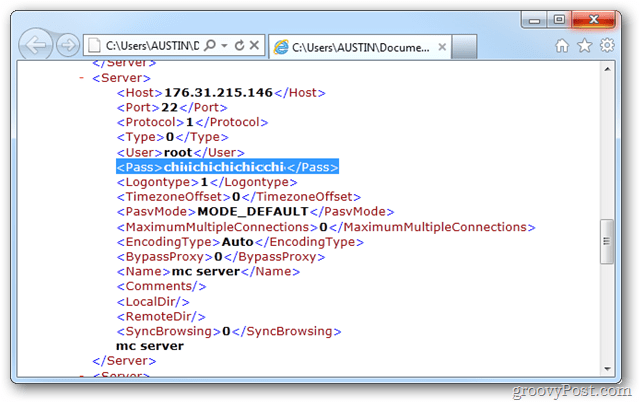 Now you should be able to recover your Filezilla passwords from the XML file. @Norman – Awesome. It’s a little obscure but practical so I appreciate the comments. Austin had a nice find on this one. Is there a way to decode it correctly? Great, Jimmy! Both, Austin & you Jimmy, made it possible to recover my ‘long lost’ password. :-) Austin’s solution seemed incomplete without this Base64 inclusion. :-) I was feeling stuck at this. Thank you very much, Austin and Jimmy! Thank you so much for this! So simple and easy. You don’t know what mental stress I had to go through trying to figure out what my passwords were. Thank you again! You are very welcome! Welcome to groovyPost! Thanks very much – this post was exactly what I was looking for! An eye-opener and a day-saver! Thank you thousand times! Fantastic. This post was a time saver. Thank you!! Man…. Thanks a million Bucks… I owe you a Burger! Worth knowing that for the day that I can’t find a password. Pity you can’t do that from the dashboard. Thank you so much for this, I’ve gotten so used to just using the site manger in FileZilla that I forgot the password for my site and have been trying to remember it all day so I could give access to one of my coworkers. This was really useful for me, thanks! just decode the password with a decoding tool (e.g. https://www.base64decode.org/). Is there a way to disable the password encoding? That would be handy. The function did not work. No servers were shown at all. The information are just stored in the quick connect history. Are there any alternatives to tackle this problem? Happened to me aswell, Im quite new to all this and a technician asked me for my FTP account but I cant seem to know what exactly my password, host etc is. Any Luck Finding a solution? and filezilla must be re-installed while i don’t have any backup data? can i still retrieve or recall the data from the server? …Any ideas? I’ve been trying to log in the *entire freakin’ day* and it just won’t accept anything I put in. I am switching to a new computer and I was very worried on how to retreive all my FTP password. Exporting to xml worked wonders. Life Saver! THANK YOU!!!!!!!!!!!! I would like to retrieve all the usersnames and passwords from the filezilla server, any idea how to do this?